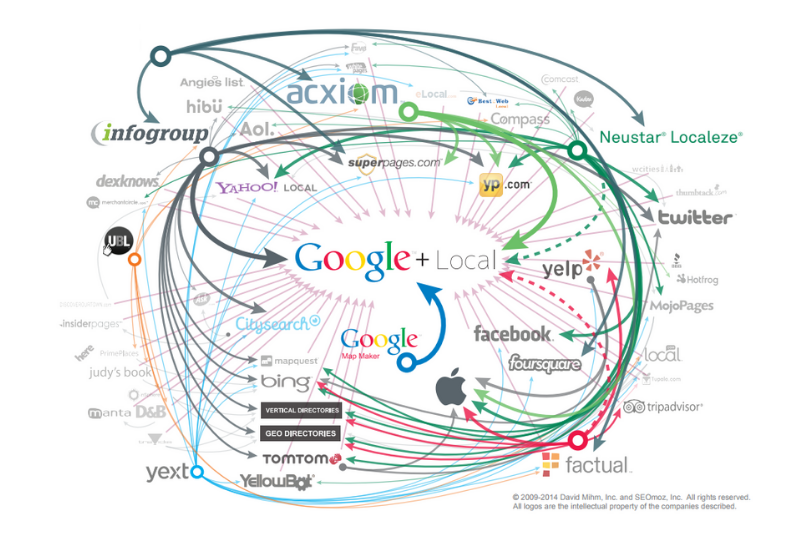 The local search ecosystem is chaos. Past attempts at addressing location accuracy have failed to start at the source of the problem: Telephone companies. Despire far more fragmentation today, listing distribution still starts with the telephone companies and saturates the market from there. By partnering with telephone companies to address the root of local listing information, manage all changes, and even consolidate telephone company billing, DSI Solutions has become the first location management provider, not just a listing syndicator. To properly manage and update telephone company records, DSI Solutions will serve as the billing party for local phone service and deliver Invoice Management services. This tactic will provide DSI Solutions the necessary visibility into existing telephone company billing and listing records, as well as provide the authorization required to modify erroneous records. All telephone company records will be audited in comparison to the active locations list. DSI Solutions will submit the necessary change requests to update or remove erroneous records. Unnecessary or redundant phone numbers will be revealed resulting in financial savings. Furthermore, administrative and payment processing expenses associated with managing telephone company invoices will be eliminated. DSI Solutions provides efficiencies for Accounts Payable departments by receiving, itemizing, consolidating, and processing your telephone company invoices. Our service will reduce your internal AP costs AND deliver additional savings through handling all billing disputes, negotiating credits and executing cost-savings opportunities. The only thing worse than paying invoices is realizing the significant cost associated with the time and effort to process and pay those invoices. Some of the most painful and expensive invoices to process are telephone company invoices, especially for national clients with hundreds of locations and dozens of telephone companies. DSI Solutions has been processing, itemizing, consolidating, and auditing invoices for 30+ years. By leveraging OCR and proprietary applications, the time to process and validate invoices is similar across all invoice formats (i.e. paper, downloaded, EDI, etc.). As a result, you will realize significant administrative savings. 1. DSI Solutions transfers billing contact for appropriate accounts to our management and facility. 2. DSI Solutions collects billing statements in an automated fashion and itemizes charges to reveal respective account detail. 3. Invoices are audited to ensure they align with account detail, accounting and/or ERP system, or other provided information. 4. Charges are consolidated into one invoice with an itemized report. The direct benefits of our Invoice Management are significant. However, when Invoice Management is integrated with DSI Solutions’ Listing Management efforts, you will have the highest probability of brand consistency across your local listing information. Others provide listing syndication. DSI Solutions provides holistic Listing Management. Leveraging DSI Solutions' Telecommunications Invoice Management records and your existing vendor relationships, partnerships are formed with Marketing, Telecommunications, & IT departments to serve as a single source for the management of your location information. The result is improved brand consistency of local listings, both on and offline. You will finally receive end-to-end management of your location data. Our unique approach of starting with the telephone companies allows for the first and only proactive approach to the syndication of your listing information. Through DSI Solutions' integrated solution, we architect and own the process for the dissemination of your location data. Such ownership includes oversight of your telecommunications accounts to ensure your listing information is up-to-date at the source of the local search ecosystem. This approach provides a central point of entry for all parties that require access to your location data. In simpler terms, DSI Solutions serves as the author and owner of your location list. Any systems, departments, and/or 3rd parties dependent upon your location information will receive such from DSI Solutions.